Google Analytics is a free web analytics service offered by Google that tracks and reports website traffic & sales data from your store. You can sign up for a free account here. Follow the steps outlined on the AspDotNetStorefront manual to configure your website tracking. In some cases, we might request that you grant us access (adcenter@vortx.com) as an authorized user. 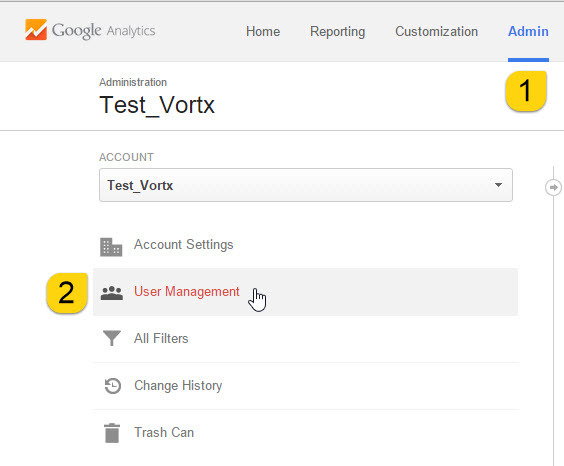 Below you will find step by step instructions to add Vortx as an authorized user on your Analytics account. Google has also explained this process in this article. Select Admin tab at the top of the page. Select User Management on the left navigation. Select "Edit" from the drop down. Check the box to "Notify this user by email".